Gabe: "We are not announcing anything at E3. 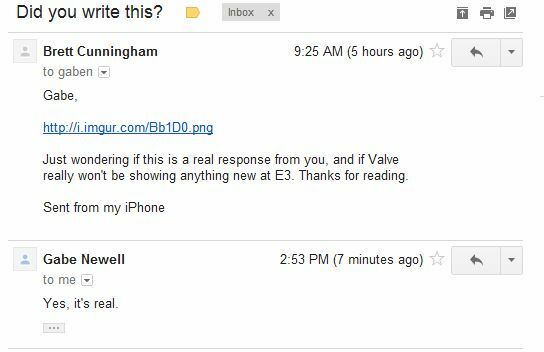 Really"
Master of all things Valve, Gabe Newell, has been talking E3 plans. Sadly, they're not as exciting as you might have hoped before reading the headline. CVG have highlighted a post on Valvetime which features words supposedly typed by the hands of Gabe himself: "We are not announcing anything at E3. Really. We are not announcing Half-Life 3 or Portal 3 or Left 4 Dead 3. We are going to be showing stuff everyone already knows about (CS:Go, Dota 2, 10' UI)"
Wait a minute... "Half Life 3 ?" Is that Gabe's new name for Half Life 2: Episode 3? Guess we'll find out soon enough. Not as soon as E3 though, which kicks off in about a month. But no Portal 3 or Left 4 Dead 3? That's a bit sad. I am still excited by the prospect of a Steam 10-foot UI though. I love my office, but sometimes I yearn for the extreme comfort that can only be achieved by lying horizontally on a sofa. If you're still suspicious that the words might not have come from Gabe, there's a video and secondary email around. We've also talked to Valve about the significance of E3 before. Read Tom's piece on Valve bringing the PC to E3 for more.